Hello friends! It is officially December! As you may have noticed by now, I am not participating in Blogmas this year. I am just too busy with my full time job and making music my little side hustle. I couldn’t think of enough topics to cover it. But today, I did want to talk about something I have been doing: rough cut recordings! Back in October, I started posting videos on YouTube! I am not much of a video person, so I decided to start my channel by posting rough cuts of me playing different pieces of the flute repertoire. Today, I want to talk about why I am doing rough cuts at this point, and how I think they can help you all as well as myself. Rough cuts are easy, because I can film myself playing a work or excerpt and then post it. I don’t need to spend a ton of time editing the footage to make it perfect. The video can go up as soon as I am done filming it. As a busy musician with a full time day job, being able to film and immediately upload the video is awesome. I don’t have all that much time to dedicate to editing videos much less filming them in the first place. Filming and uploading a rough cut is a lot easier and less time consuming than if I were to edit. I can share more content with you guys more quickly. 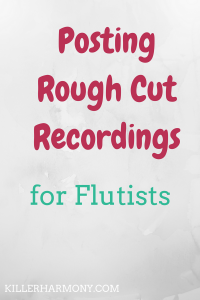 Rough cut videos are a great tool to use for every musician. They are great for my own use, because I can learn from my mistakes. They are great for viewers, because you can see that I am not perfect. Rough cuts go behind the scenes to reveal the “secrets” of pro and semi-pro musicians. I can learn from myself, but my real goal is for you all to learn from my rough cuts. These videos show my mistakes, and if you make those mistakes, you can then understand mistakes aren’t bad. If you make my same mistakes, you can then learn from them, knowing that you are not the problem. Some pieces are not written to be easy. A lot of musicians have to use social media and the internet to build their careers these days. That means that skilled musicians could come off as perfect. If a musician knows how to edit their photos or videos to appear as this perfect person, they aren’t relatable. Posting unedited footage leaves the musician vulnerable. They show the world what musicians a generation ago showed their audition committees. The openness of rough cut videos shows a side to me (or any musician) that the internet would otherwise allow to stay hidden. I love showing off a vulnerable part of me, because it proves that I am human. I make mistakes. Being a perfect musician is not a fact of life for many of us. That’s okay. I hope you enjoyed this shorter post. I think it’s important to share the unedited version of myself once in awhile. If you haven’t already, be sure to check out my latest video. I want to start posting weekly on there and to continue to show off what a real musician looks and sounds like.